Ready for plentiful creative breakthroughs and a BIG leap forward for you and your business? 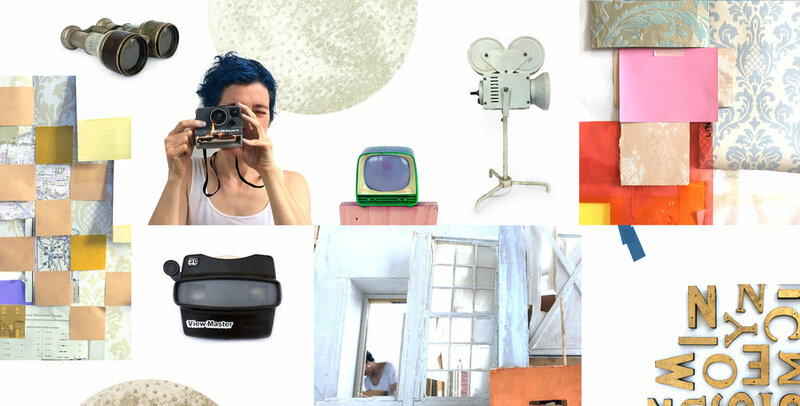 Come collaborate with an experienced + inventive creative director for a day. Within all the demands of running a business, it can be all to easy to neglect the very things that matter most: the body of work you’re creating, and the courage to spread the word with imagination and ingenuity. Stop letting indecision, isolation, confidence blocks and overwhelm get in the way of showing up with bold originality and fresh thinking in your branding and marketing this year. We’ll spend one full day with no distractions, finding your creative edge, and expanding it — with solid strategic plans based on practical reality and genius creativity. you + me + your brilliant biz. One full day. in person, or online. We’ll retreat from the “hustle” And make 2019 plans that make your work more unforgettably visible and your marketing more magnetic. We’ll ditch the “shoulds,” and re-approach your brand and marketing channels as the powerful tools for creativity, innovation + income that they are. Take it from someone who’s experienced it! "My goals for the retreat were ridiculously ambitious and included a social media playbook, a brand bible, a custom launch process, and a new look and feel for my website. We laughed - AND THEN WE DID IT ALL. We also made a plan for growing my list, a comprehensive calendar for the entire year, and then Amy showed me exactly how to double my income. Amy is a verified genius. She is a volcano of brilliant ideas and at the same time showed a rare sensitivity to my business's particular needs. The retreat was the PERFECT blend of leadership and collaboration. I will certainly not head into 2020 before booking another retreat with Amy. " We’ll look at your brand story and message, and how its being communicated through your actions, words, images, offers and more. We’ll clarify, refresh, and fine tune your vision. And we’ll do it right inside all of the programs + platforms you use and work on it together; so by the end of the day, the work is done. If your web site isn’t working to delight you and your potential clients, lets get in there with our toolboxes and make it sing. I’m a fast designer and we can identify the key issues that are holding you back from letting your web site shine. You deserve a unique, effective, gorgeous web site that feels like YOU and gets the job done. Got a new program idea, a podcast, a new offering, or something else that you want to finish and launch this year? Lets make plan for completion, production, distribution, marketing and sales - soup to nuts. And lets make it AMAZING. Let’s look at the core of the work you do and figure out how you can nourish it in 2019. Sometimes we are so embroiled in working ON our businesses that we neglect parts of working IN our businesses: and part of that is doing the DEEP WORK that allows us to create intellectual and creative products such as books, bodies of visual art, new programs, new media projects, and more. Lets plan your year so that the deep work will happen in the ecosystem of your business. Do you see social media channels as art and performance spaces? Social media marketing should never be a place of boring tasks or overwhelm - they are spaces to create, experiment and continually evolve your message. Lets create plans that will get you great results, based on practices that support to how you uniquely think and create. Your day might be a combination of these things, or something different entirely. If you are running an business, its likely that your most vital creative processes and insights can rarely find space inside the fast, fragmented schedule you have to keep. While it’s good to make ANY time for creativity, those squeezed-in chunks of time can make your “deep work” feel like one more thing to “get done.” And that’s not a good setup for creative thinking! So you can make more decisions, faster, and shave off months of deliberating from your business building process. So you can hold on to the thread of an idea as it wanders through the forest. So you can excavate depth and substance, not just speed and surface. So you can untangle the knotted parts and unstick the stuck parts. So you can explore ideas that we wouldn’t give time to on the average workday, and just maybe grow a genius thought that simply needed some sun and water. When you set aside a long, uninterrupted period of time to create, you signal to your mind that more is possible than on any other “normal” day. You invite deeper levels of complexity into the process. your creativity rises to the opportunity. And we all need that. What does the retreat entail? to create prompts/assignments you can use to prepare for our day together. WE DEEP DIVE! Don’t worry, there will be dance party breaks (or nap breaks, whatever you need.) If it’s in Amy’s Providence, RI studio, a yummy and healthy lunch will be provided, and there’s acupuncture, yoga and other good services in the building. Two to four weeks post-retreat, this call supports the refining and implementating of your plans. You are ready for a LEAP and you are SICK of the incremental change that happens when you can only devote small shreds of attention to the creative work behind your branding, marketing and programs. You feel creatively alive and inspired working in collaboration, when its with a big thinker and active listener. You know (or suspect) that you have resistance to key parts of the creative processes behind business building, branding or marketing, and you need someone to lend confidence and structure so you can get it done. You’ve got a new program, project or idea that wants to be born, and you want to give it a big jump start with the assistance of someone who can help guide you through the creative process, and the decisions that will make it real. Though your work is strong, you lack clarity around your presentation to the world; whether in your identity and brand, your visual communications, or something else. Then lets get our big paper and sharpies on! The investment for the full retreat (day-long retreat, prep call and intregration call) is $2800 USD for an in-person retreat, and $2200 for a virtual retreat. A deposit of $500 is required to hold your retreat date; the remainder is due at the time of the retreat. Other installment arrangements are negotiable. These are available for business builders who are doing social justice and/or cultural change work and are from communities traditionally marginalized in the digital small business world. Please inquire if this might be you. Your imagination is made for this moment, this life, these times. Feed it!